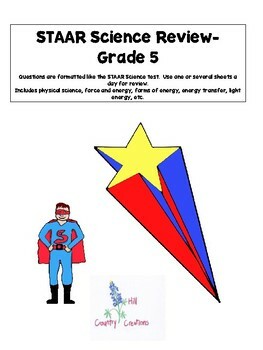 These review sheets allow students the opportunity to review for the fifth grade science STAAR test. 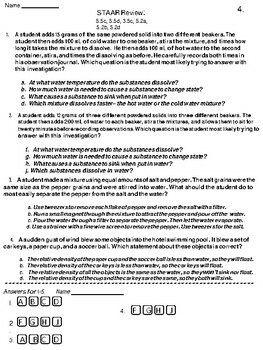 Most pages have 4-5 questions that are formatted and very similar to what has been on previous tests. The sheets concentrate on these categories: Matter and Energy, Force Motion and Energy, and the very difficult Scientific Investigations and Reasoning Skills. 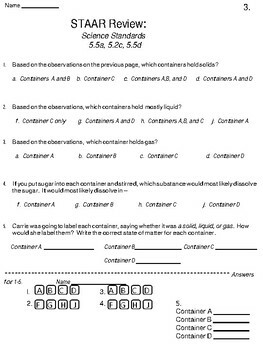 Students must gain information from many charts, diagrams and tables. The sheets are formatted so that students can cut off the answers at the bottom and turn it in as an exit ticket at the end of class. 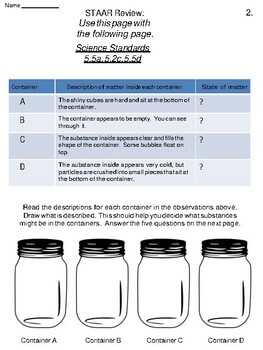 The teacher can use it as a warm up sheet to begin science class, or these can be used as homework. Standards are placed at the tops of each sheet so teachers can keep track of what is being assessed. Concentration is on physical science, process skills, and the water cycle. I am hoping to do another set concentrating on earth and life science.